Within the town, Nenagh Castle, with its unique circular tower built in the 13th century and refurbished in the 19th by an enthusiastic bishop is the main attraction. It stands in a pleasant little green, surrounded by trees. Nearby the old gaol, with its beautiful octagonal governor?s residence, has been happily reduced to the status of an historic monument. The grounds of the splendid courthouse nearby have recently become the site of bronze sculptures of three of the greatest of Irish athletes. Situated 3 miles north of Nenagh town, the sand based hills of Beechwood provide the perfect setting for this superb championship course, which offers spectacular views over the wonderful Tipperary countryside stretching from the Silvermines and Arra mountains across to Lough Derg. After leaving the eighteenth, golfers can enjoy the warm hospitality of our club house, bar and restaurant. In many ways Lough Derg is a place apart.In today's modern world-where everything is fast and instant-Lough Derg still manages to maintain a pace where people have to move more slowly, where the mind can be stilled. Given that it has survived for over a thousand years, that it continues to attract pilgrims and give them hope, there is nothing to suggest that it will not be here in another thousand years. Nenagh (Aonach Urmhumhan in Irish) is the administrative capital of North Tipperary with a population of around 6,000 people. It is a most accessible town as it is served by the N7 travelling south from Dublin and north from Limerick, 100 miles and 25 miles away respectively. Conscious of its central location, Nenagh has striven to accommodate passing visitors and encourage overnight stays. Consequently the town has a wide range of popular places to stay and eat in. 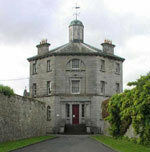 Nenagh Heritage Centre is located in two stone Georgian buildings which were built in 1840-1842 as the Governor’s House and Gatehouse of an extensive goal complex for North Tipperary. 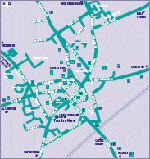 The building is located just a short walk from Nenagh town centre. The Heritage Centre is open all year round Monday to Friday from 9:30 – 5pm. Also open Saturdays from May – September from 10am – 4:30pm. Admission: FREE!